Around this house, we love the books of Doctor Seuss. They’re easy to read (with the exception of Fox in Socks, one of my favs), have great messages, and contain fun illustrations of crazy contraptions. The books almost always follow the same poetic meter, anapestic tetrameter. During Dr. Seuss Week a couple years back, I was moved to write a book in anapestic tetrameter, featuring Gavin and his favorite stuffed animal. Traci took pictures to match and we published it on our family website as The Ape in the Cape. 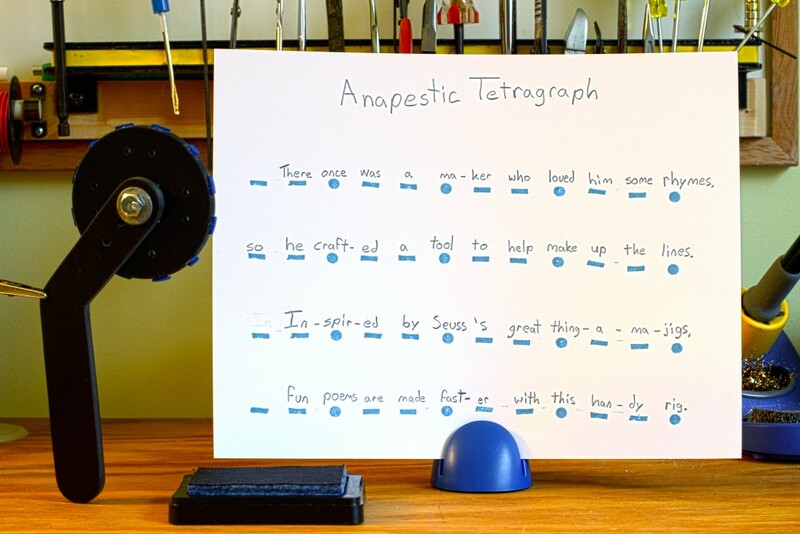 This year, inspiration struck me in the form of a tool that would help people learn and use anapestic tetrameter to write their own poems and books. I call it my Anapestic Tetragraph. By rolling it on the ink pad and then on the paper, you can quickly set up a guide that tells you which syllables should be stressed. It’s nothing more than a homemade stamp roller, I know, and the marks it makes on the paper aren’t anything you couldn’t sketch up with a pencil. I had plans for the tool to make the sounds of anapestic tetrameter as it marked them, but I couldn’t scrounge anything suitable to make percussion sounds in such a small package. Plan B, optical encoding and electronic sounds, didn’t account for handle orientation and got scrapped during the breadboard phase, though you can still see the holes on the wheel and handle. Plan C was a complex series of tiny switches hand-made from guitar string, but that was getting too complex for such a simple and silly toy. I’ve ordered some microswitches for plan D. When those arrive, I’ll see if that plan works any better. 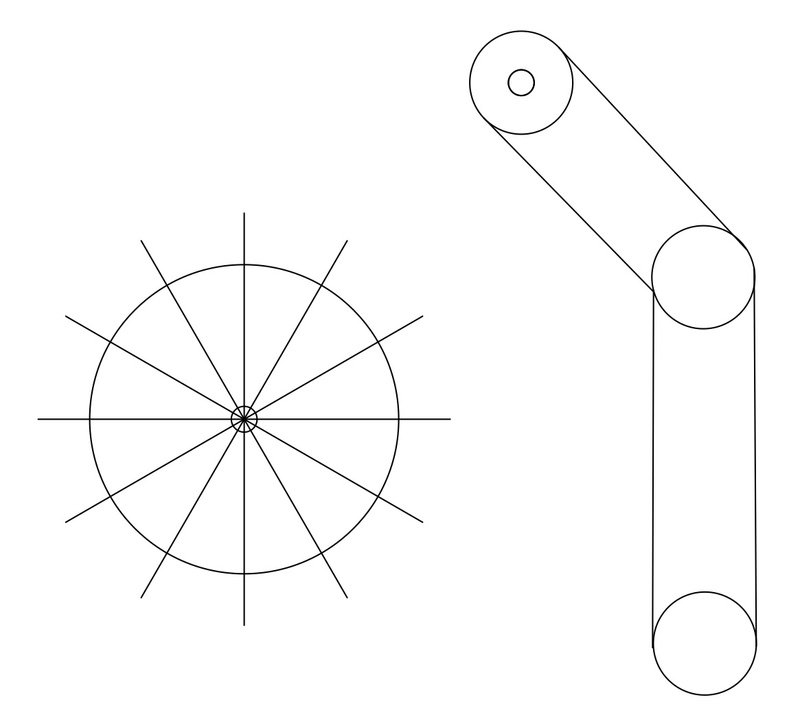 For the device’s construction, I used a CAD program to make templates for the shapes and the positions of the stamps. My scrollsaw made quick work of cutting the templates out of 1/4″ thick expanded PVC sheet. I cut the individual stamp bits out of thin craft foam using scissors for the “ana”s and a whole punch for the “pest”s. Hot glue holds the stamps to wheel. As it is now, it’s still lots of fun to use. You just roll it on the stamp pad to ink it up, then roll your paper. As infrequently as I write poems, I need all the assistance I can get. It definitely helps to have the meter down first as a guide. Make your own and have fun writing some poems.